Eggs and tomatoes make a nice pairing, so I was excited when I saw a new way to make eggs and tomatoes in a hundred-year-old cookbook – Poached Egg in Tomato. Preparing the tomato shell for the egg reminded me of scooping a pumpkin but on a much smaller scale. And, it was fun to slide the egg into the tomato shell, and cover it with a circle of parchment paper that I’d cut out. The Poached Egg in Tomato was delightful with toast. The one downside – it took longer to bake than I anticipated. I had to delay breakfast because it took about 45 minutes for the egg white to fully set. Preheat oven to 350° F. Cut the top of the tomato and gently scoop out the pulp, then set the tomato in a ramekin or custard cup. Break the egg into a small bowl, then slide the egg into the tomato shell, and sprinkle with salt and pepper. Cut circles from a piece of parchment paper that is the same size as the ramekin; then cover the filled tomato with the parchment paper circle. Place the ramekin into a small cake pan or other oven-proof dish or pan. Gently pour hot water (approximately 125° F.) into the pan until it is about 1 inch deep. (I use the hottest water that comes out of my tap.). Place into the oven and cook until the egg is desired firmness (approximately 45 minutes). Posted on August 21, 2016 August 20, 2016 by SherylPosted in FoodTagged eggs, tomatoes. Thanks for the kind words. I often struggle with my food photography, and its wonderful to hear that you liked this picture. I also was pleased with how it turned out. I find it really interesting how some recipe ideas and food presentation styles have changed (or in some cases not changed) across the years. Oh this looks so good! Would taste good for a light evening meal . Yes, it would work well for a light evening meal. It’s nice when served on toast. I think that you’ll like it. In the photo I have the toast on the side – but it actually works really well to serve the egg and tomato on the toast. The tomato will produce some juice that the egg poaches in while cooking, and it’s lovely when the egg/tomato mixture slips out onto the toast when you break it apart to eat . This looks so delicious! I will make it right now. Thank you! I think that you’ll enjoy it. If you get a chance, let us know how long it took to cook, etc. I’m always trying to collect information on others’ experiences with these old recipes because it helps other readers who may want to try it. I do love tomatoes and eggs together, and this is a combo I’ve never seen. It’s easy, and I suspect very tasty. The long bake time wouldn’t be a problem for a weekend breakfast, or even for a light supper. I make a similar recipe, adding chopped parsley, a sprinkling of parmesan cheese and a teaspoon of cream. mmm. . . it sounds delicious with these additions. This looks very modern. I would never have guessed it came from a hundred years old recipe. It’s interesting how some old recipes and cooking techniques can seem surprising modern. Your mother’s way of making a similar dish sounds lovely. Ham would be a wonderful addition. Looks fantastic AND actually adheres to my diet! Hello lunch on Monday! It’s good to hear that this recipe works with your diet. It’s so attractive and makes you wonder why you don’t see it on fancy restaurant menus! It does make a lovely presentation. I’m not sure why, but it seems like most restaurants aren’t very adventuresome when comes to egg dishes. I inadvertently assumed the recipe called for an ‘old egg’ and am relieved to discover that a fresh one will do nicely 😉 . It looks good. hmm. . . maybe I should have titled it “Old Fashioned Poached Egg in Tomato Recipe.” I hadn’t thought about how it could have another meaning. Right now we have a glut of tomatoes and eggs, the hens are laying non stop, so this will certainly be on the menu today for lunch, outside on the terrace under the shade of the lime tree – perfection, thanks! The setting for you lunch sounds so beautiful and serene, and absolutely wonderful. I hope that you enjoyed this recipe. Looks delicious; good to know another way to cook my favourite combination of egg and tomato. 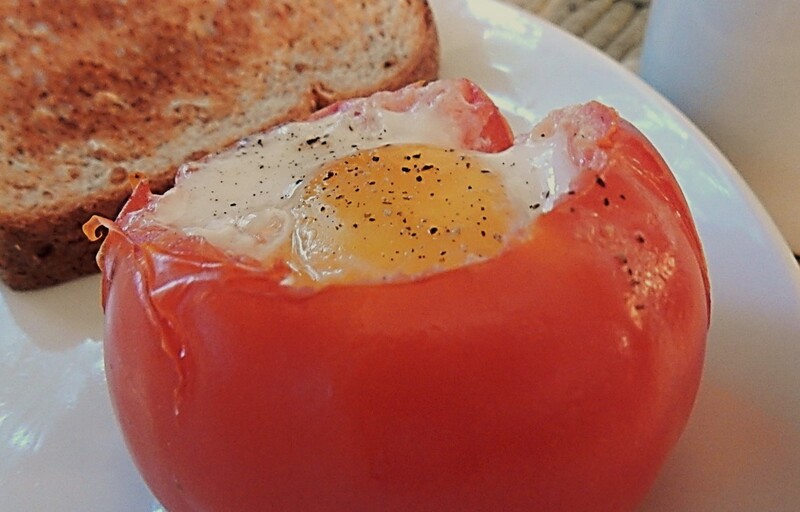 If you like eggs and tomatoes, I think that you’d enjoy this recipe. What an interesting technique. I wonder why it went out of style–it seems so sensible and yummy! I never saw a dish like that. A great idea and it would make a nice supper. Yes, It would make a lovely light supper. Boy! It looks like it was worth the wait!!! I’m sure I would love it! It did make a lovely presentation. Another lovely recipe that is simple in prep and pretty to eat. Pretty food is a must for me! I agree- attractively presented foods are much more appetizing. I remember the first time I tried to poach an egg in the oven, and it took forever it seemed like. I think I’d bump the temp up to 400 degrees and see if that helps. Looks delicious, though! What a fun, tasty combination! It is a fun recipe. I think that you’ll like it.